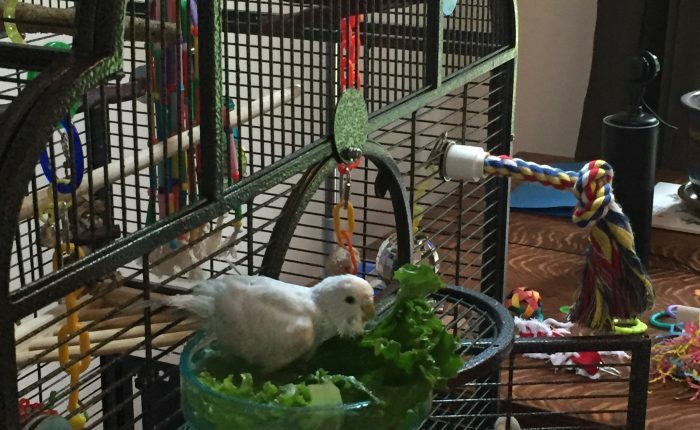 This should be a pretty short review of the lixit quick lock bird bath – really all I want to say is “buy it!” I am always on the lookout for products to help my budgies bathe. They aren’t into the running tap or taking a dip in their water bowl. We’ve had success with hanging greens upside down in the cage for Toby to use as a shower, but Kelly wasn’t a fan of that method. So, I decided to try the Lixit Corporation BLX0787 Quick Lock Bird Bath . This is a two part system, one piece is installed semi-permanently on the cage, and then the bowl locks securely in and out of place on the base. You can install this either on the interior or exterior of the cage. I chose exterior so that any water mess would be mostly on my kitchen tile and not soaking the rest of the cage, toys and liner at the bottom of the cage. It installed very easily and twisting gate bowl into place is simple, and very secure. The budgies seem to like that they can see the water from outside the bowl, and the width of the bowl is perfect for a parakeet to spread out. Initially, they both needed there to be some kale or other greenery in the water to understand that it was a bath. Toby still isn’t the biggest fan but she’ll at least get her feet wet. Kelly loves bathing in the Lixit bath with or without greens now, which it great. I can tell she really likes diving in and splashing around. I usually heat their bath water in the microwave in a coffee mug for 15 seconds, but Kelly will wait until it’s room temperature or even icier before jumping in – I suppose there is no accounting for personal preference! As I’ve talked about before, bathing is incredibly important for parakeets, especially as we are headed into winter, since it can help them with dry feet and overall comfort. Also, it can help the humans who might be a bit allergic to parakeets, as they remove dust and loose feathers with a good soaking. 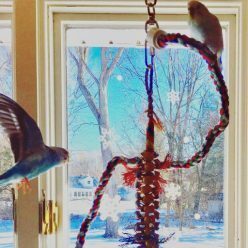 I don’t have anything bad to say about this product, it’s inexpensive enough to take a risk on, and there’s a good chance your parakeets will love it too! If it doesn’t work out as a bath it would still be a perfectly good water bowl or even a food dish. In the pictures below you’ll see how utterly soaked Kelly got during her first bath! Next Next post: Merry Christmas from our flock to yours!